Omar Khayyam knew how to live! discoveries we’ve been making on deconstructing the symbolism of Saturn, I’m looking at it with a new perspective. If you’ve never read it, I’m linking it at the end of the article. It’s an inspired poetic meditation on what Saturn represents as the inescapable facets of life. 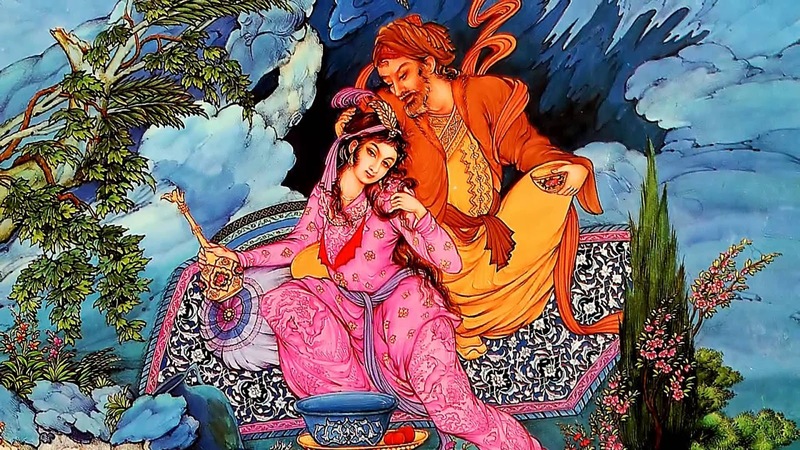 For all his talk of wine and song, Omar the astronomer-poet of Persia saw the world about as clearly and inclusively as anyone. I think it’s important to bear in mind that what poets and artists have written about Saturn and its somber vibrations is often at odds with the weaponized symbolism of the 21st century oligarchy. Khayyam did his time at the Sultan’s palace and made significant contributions to science and mathematics. However, his free spirit, piercing intellect and creative genius often made his time at court a burden. He saw through the hypocrisy of authority and the futility of worldly honors. What he made of his experience is captured in the grand poem of the Rubaiyat, a moment for the ages. Here’s an except. 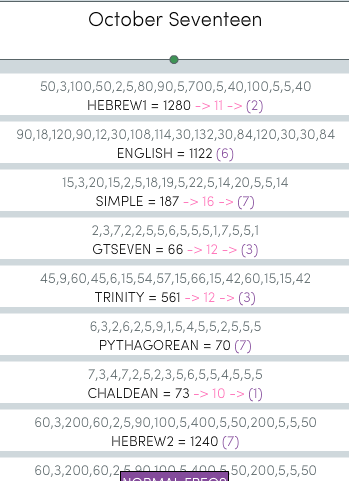 When I think of the “two and seventy jarring sects” it reminds me of Yahweh’s punishment at the Tower of Babel where humanity was fragmented into 72 languages. 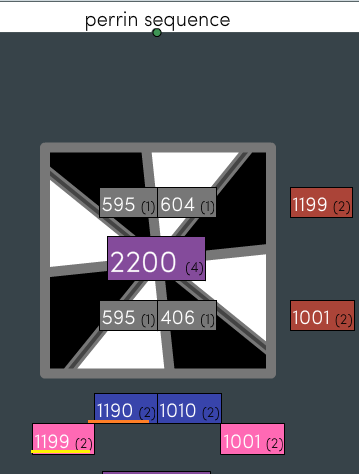 Division. Conflict. With 72, there is also a relationship to the precession of the equinoxes, as described in Part II of this series. It takes 72 years for the celestial axis of Earth to move one degree. It takes 25, 920 years or roughly 26,000 years for the axis to complete its circle. The line “Life’s leaden Metal into gold transmute,” has a great deal to tell us. In alchemy, each of the planets and the Sun and Moon rules over a particular metal. Lead is the metal of Saturn and the Sun is gold. That’s corresponds with cube, Pan, and other relevant words covered in this series. When I saw 22 come up, I realized that lead as a homonym for the word lead as in taking charge parallels another word with 22 gematria. As explained in Part II, Saturn is considered the master planet, because before Galileo it was seen as closest to the realm of fixed stars. The 31 figure is the English ordinal ordinal sum for both cube and Pan. 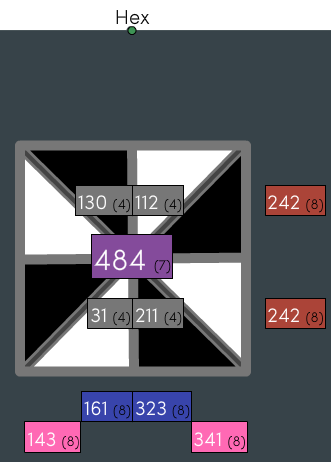 144 is 12 x 12. There are 12 houses and 12 signs in the Zodiac. Here’s the link to the illustrated version of the poem. of their sons. This was his futile attempt to forestall the prophecy of his demise, at their hands. Why did Kronos turn evil? What does this mysterious and brutal symbolism have to tell us? The figure below is a drawing by Johann Kepler that’s found in his book Mysterium Cosmographicum. As it appears in this version, it was reprinted in the 1969 book, Hamlet’s Mill by Giorgio de Santillana and Hertha von Dechend. As it turns out, Hamlet’s Mill is a gold mine of information on how kings, priests and philosophers in former times from Kepler back to the Stone Age were obsessed with Saturn and his role as the Demiurge. This is Plato’s term for his concept of the creator-god, Pan/Kronos/Saturn. 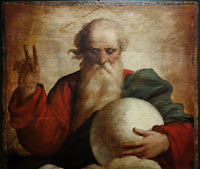 This creator-god attribute of Kronos isn’t discussed as often, but it’s just as important as his role of “The Destroyer,” which is more widely known. In our left-brained dominated hyper-literal world of today, Kepler’s Polyhedra seems a mere a thought experiment with no apparent connection to science. 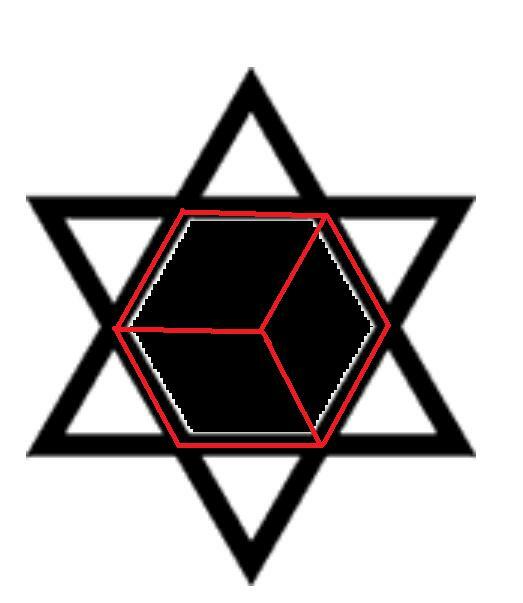 Yet, as we’ve discovered in Part I of this series, on a symbolic level, the relationship of the planet and god Saturn with the cube is central to understanding how the Elite of Earth operates. 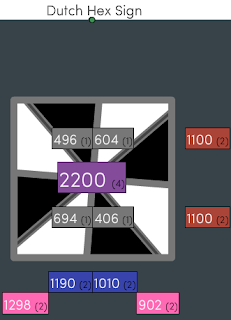 It doesn’t take a stretch to see how a cube is a box or a cage. If you need to keep something hidden or keep someone from getting out,or getting away, a cube is perfect for the job. That’s the most visceral aspect of the cube and Saturn’s customary designations as “The Obstructor,” or “the Inhibitor.” In astrology the planet Saturn symbolizes among other things process, discipline, karma, punishment, necessity, and lastly, death. Yet, above all of these realms is Saturn as the Keeper of Time. Kepler’s pictorial theory is based on the following idea. The orbital patterns of the planets each provides just enough space for each of the five Platonic solids to fit within the volume of next smaller planet’s orbit or path around the sun. The exception to this pattern is Jupiter, which is represented as a sphere. The cube inside the bowl represents the area of Saturn’s orbit of the solar system. Mythologically and symbolically, Kepler is showing us how Saturn, with the largest and farthest orbit from the Sun is in the master position, from the point of view of the model. The cutaway sphere just inside the sphere is the orbit of the planet Jupiter. The inner planets of Mars, Earth, Venus and Mercury are the other solids, the tetrahedron, dodecahedron, icosahedron, octahedron, in that order. I’m pretty sure that Kepler designated Jupiter as the sphere because of the jovial and expansive nature astrology assigns to the planet. I’m still working on finding confirmation on this. At the time he came up with this idea, the available astronomical data made these speculations scientifically plausible. 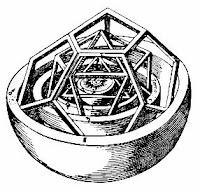 Kepler eventually realized “The Polyhedron ” was not a scientific description of the solar system. Nevertheless, the symbolism of Saturn’s Cube is there for all to see. Earlier, I pointed out that the orbits of the planets can also be referred to as paths. This word is important because it’s an anagram of Ptah, the Saturn of the Egyptians. Adding together all the numbers from 1 to 9 produces the sum of 45.
tracing the “path” from 1 to 9. 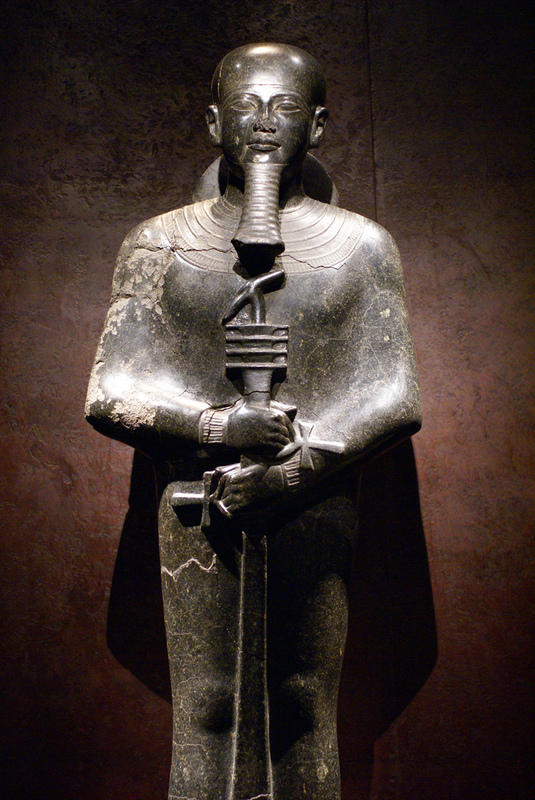 It was the god Ptah who spoke the divine word of “Atum!” and brought the universe into being with the power of the creative word. Atum in his turn created the rest of the gods who were known to all of Egypt and of all time as the Sacred Nine, or the Ennead. The number 45 also corresponds to what has been called the Magic Square of Saturn for centuries. Pictured below, one sees how the rows and columns all produce sums of 15. With 3 rows and 3 columns the product of 3 x 15 = 45. Also as one can from the picture above on the right, the association of Saturn with “the path” is encoded within the Sigil of Saturn. “Faber Deus,” God the Maker. In the original Greek version of Platos’ Timaeus the statement appears as πᾶν διεῖλεν ψυχὰς ἰσαρίθμους τοῖς ἄστροις. My own layman’s translation of this is “Pan set forth unto every soul, a star.” So here we have a paradox. According to Plato, the Demiurge is Pan and Pan is Saturn. This veiled analogy was pointed out in Part I of this series. 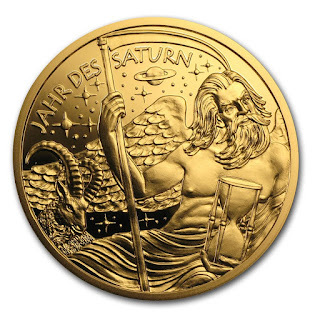 However, the symbolism of Saturn as a loving creator and helper of mankind eventually morphed into the extremely evil and disgusting image of Satan, the Devil of Christian imagination. Somewhere along the way he was even equipped with a trident for more terrorizing effect. 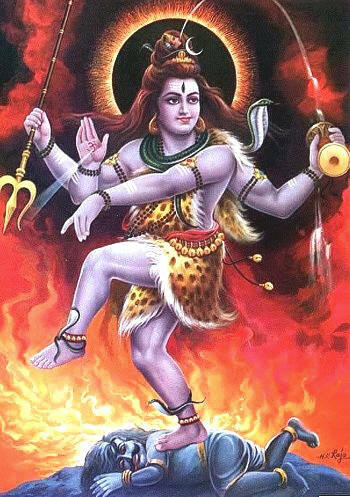 Yet, a closer look reveals that Satan’s trident was originally the trishula of the Hindu god Shiva, the Saturn of India. The Hindu counterpart of Saturn is Shiva or Siva.who is portrayed with a third eye, a symbol of the pineal gland. Throughout time mysticism has been about the stimulation of the pineal gland in order to produce visions through meditation and chanting. The pine cone has been a symbol of the pineal gland and the path of enlightenment for thousands of years. 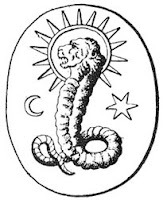 -g pattern, seemingly to point out a relationship between the serpent and gnosticism. I’ll get to some more of that a little later. When viewed from this perspective, we’re getting close to the theme of The Matrix film series, where the illusion of the digital realm masks the reality of the physical world By extension, gnosticism is the belief that the physical world masks our full understanding of the spiritual universe, which is all around us, but most fail to see. The “Architect” of the The Matrix. Also in gnosticism, there is a class of being known as the archons, who are essentially demons or fallen angels, whose job it is to keep human souls earthbound and enslaved to physical reality. In the Matrix series it’s the Architect and his programmed robotic guardians like Agent Smith who harvest the bio-heat from human beings as energy for themselves. 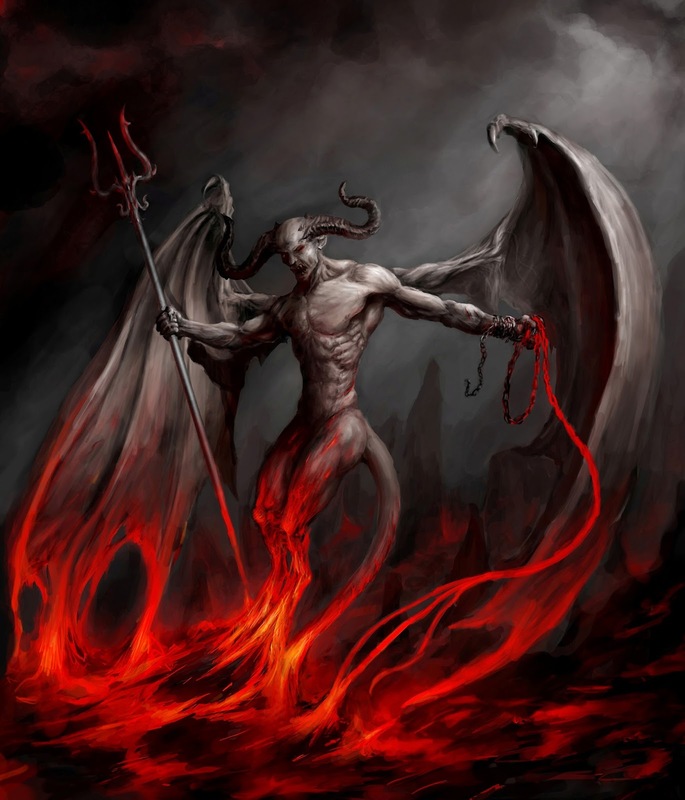 This is reflected in the more radical versions of gnosticism which speak of beings like incubi and succubi. They are akin to the elemental spirits of the air, fire, water and earth who “feed” upon human emotions and thought. In this article, there isn’t space to go into detail about the wide spectrum of the body vs spirit question found within differing sects of gnosticism. However, it’s clear that there’s a common playbook involved in all of these connections. The term “obliquity of the elliptic” refers to tilt of the earth’s axis which causes the change of seasons. Ancient astronomers were aware of this connection, a fact that comes across in the mythology. The seasons give structure to life on Earth. 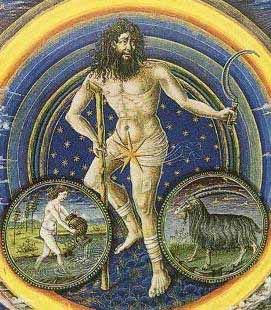 From the ancient point of view, the cycles of birth, death and rebirth, life itself could not have been possible without conquering of “chaos,” symbolized by the separation of light and darkness, and in the castration of Ouranos. The path of the Sun and Moon through the signs of the Zodiac and their annually repeating patterns are what calendars and holidays are based on to this day. 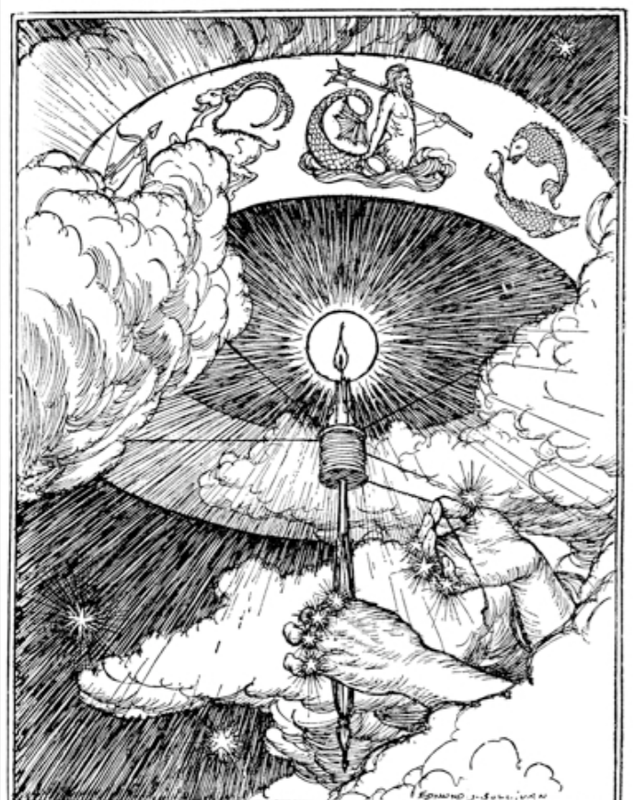 The image of Father Time and the newborn infant of New Year’s Eve are both Kronos or “Chronos,” which is time itself. Yet, that is only the beginning, Kronos/Saturn also presides over another astronomical phenomenon known as the precession of the equinoxes, which describes how our view of the heavens from Earth changes over time. The gif on the left gives us some idea of what this looks like from space. 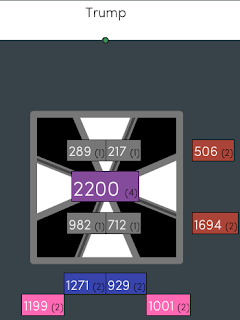 This is one of the things that is most valuable about Hamlet’s Mill. The book’s research shows conclusively that the figure of Kronos/Saturn as and his dual nature of Creator/Destroyer is stamped upon the myth and folklore of virtually every nation on Earth. He is known in many guises from Norway to Polynesia, from Mesopotamia to Mesoamerica. The unifying themes of this wide dispersal are the figure as a keeper of time, a miller, craftsman, or architect who starts off good but then turns evil. I’m linking a PDF of the book at the end of the article. It takes some creative visualization to imagine what it must have been like for the ancient astronomers and mariners who depended on the position of the pole star during those eras that did not have one. Of course, Kronos was blamed for all of the trouble. As long as the earth had a pole star, which was seen as the millstone upon which the heavens revolved, then all was well. But, when the axis of earth drifted, the orientation to the star was thrown off. Therefore, the mill post or pillar of the sky was broken apart. The pillar and the stone could no longer hold back the waters of the Abyss and the Flood came over the Earth. At the time the Great Pyramids of Egypt are said to have been constructed, around 3000 B.C., the Northern hemisphere’s pole star was Thuban in the constellation of Draco, the Dragon. There’s a whole area to explore how these astronomical facts fit in with the story of the serpent and the Garden of Eden. But for now, we can see how the drift of precession away from the Dragon-star Thuban could be interpreted as Adam as representative of the Earth being cast out of the Garden. While the axis of the Earth eventually settled on the star Kochab in the Little Dipper around 1500 B.C. It’s remarkable that Egypt’s Times of Trouble with the Hyksos invaders coincides with this period. 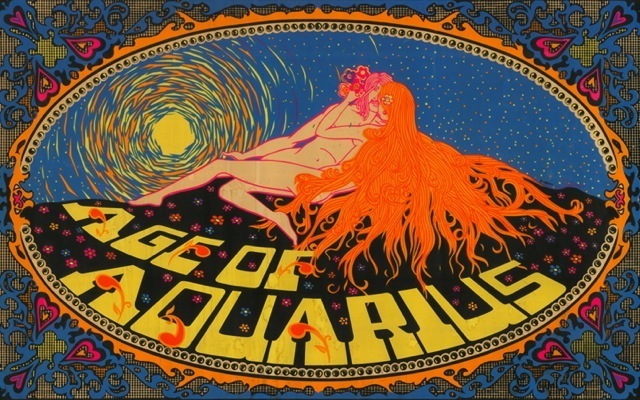 In 3000, B.C., the zodiacal sign that rose in the east just before the Sun was Taurus the Bull. 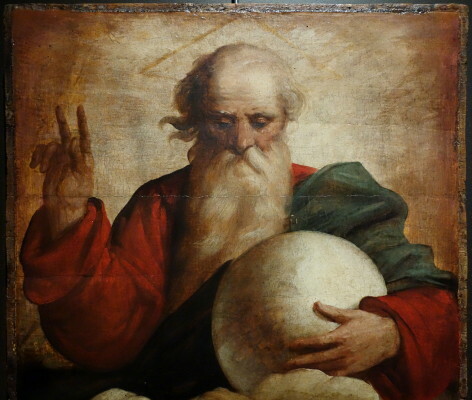 During the time of Moses it was Aries In the time of Jesus, the Age of Pisces came, which is the main reason why the Fish is sacred in Christianity. The advent of Christ the Fish marks our age. It was hailed by Virgil, shortly before Anno Domini: “a new great order of centuries is now being born,” which earned Virgil the strange title of “prophet of Christianity.”(Hamlet’s Mill 59-60). Here in the early 21st century, we are on the cusp of the Age of Aquarius. According to the ancients, we enter a new Age about every 2200 years. 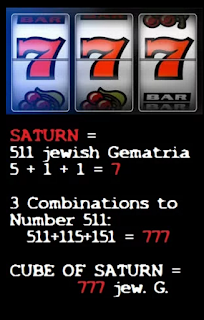 In order to show how thoroughly integrated this symbolism is world-wide across the centuries, I want to return to the discussion of the Magic Square of Saturn. Long before the square was named after Saturn, it’s original title was the Square of Lo Shu. The Chinese were the first to discover and study it, a process which began around 2800 B.C. The Legend of the Lo Shu has it that in the time of Emperor Yu, the god of the Lo River was angry and flooding the land. (There’s that imagery of the angry Flood, again) The Emperor performed sacrifices but the floods continued. A great turtle would walk around the altar each time. One day, a child discovered curious markings on its back. After putting their heads together, the Emperor’s wise men discovered that the Square of Lo Shu showed them through the power of mathematics the proper number of sacrifices. The sources I’ve found so far have been vague about what or who was being sacrificed, but in those primitive times, it very well could have been human sacrifices. 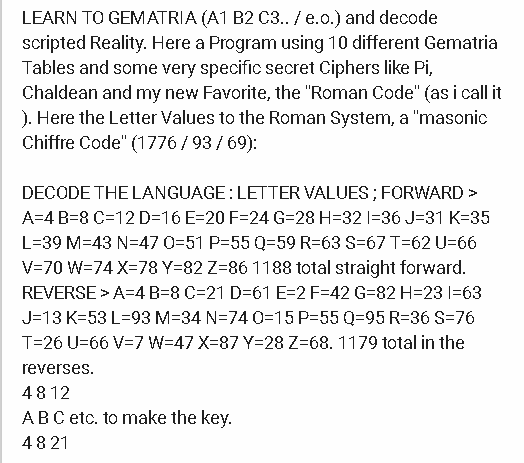 River Lo has a gematria that coincides with that of Ptah. It also is the sum of all the three way lines, of the magic square. In any case, with 15 sacrifices to appease the god, the floods ceased. The square also reflects the structure of the ancient Chinese calendar year of 360 days of 24 months of 15 days each. De Santillana also confirms that in China the mythical emperors are properly connected to Saturn. Once one understands the symbolism involved, then the coding that continues in our own time becomes almost transparent. The next series of pictures were taken by DZ contributor TiWaZz. He’s ever-vigilant and always alert to the Saturn deception. 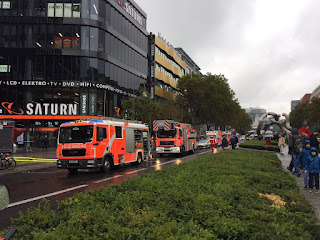 This time, he has documented the World Fountain at Europa Center Berlin, in the heart of the city. Fountain symbolism has been employed throughout time to imprint upon the subconscious mind of the observer, impressions and attitudes that the builders want internalized. The sound of the water spilling and splashing, and the harmonious surroundings would seem to enhance the effect. 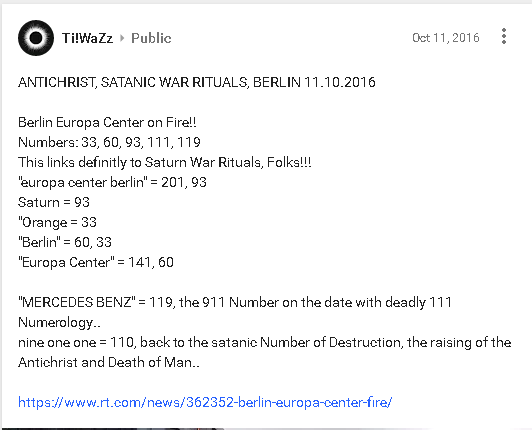 The first place to begin is to show what TiWaZz has discovered in the gematria and event syncs. Just below, here. One can see how the haiku relates on the theme of Kronos/Saturn as Father of Time. The boy on the tortoise would indicate the slow advance of time but the Saturnian symbolism goes much deeper. For one thing, on the back of the tortoise is written in primitive Greek letters, the word Pan. 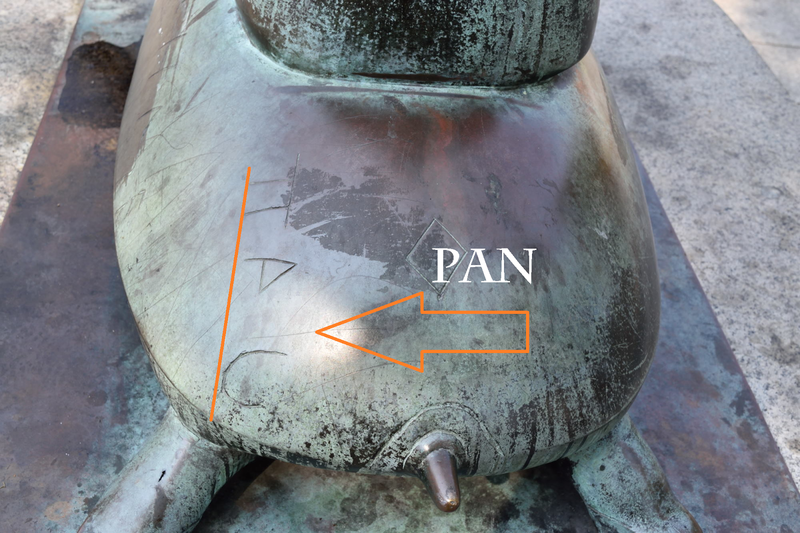 As we’ve already established, Pan is a veiled reference to Kronos/Saturn. This association also lines up with Greek cultural history, as the tortoise was sacred to Pan and killing one was an affront to the gods. Strangely enough, Pan was often said to have been the son of Hermes. Now is the time to check in with some gematria to tie it all in together. Saturn = 21ER / 93 EO. That’s important because Europa Center, Berlin = 93 ER / 201 EO. 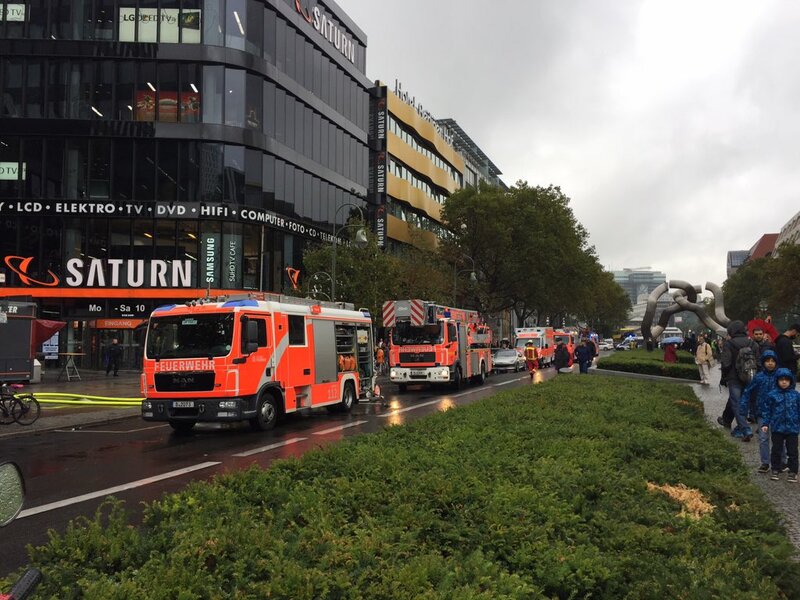 In the photo on the right from RT’s coverage of a recent fire at Europa Center, you can see the entrance to plaza. There’s a logo for the Saturn a major telecommunications corporation in Germany. As you’ll see in a moment, RT is now part of the Saturn story line. 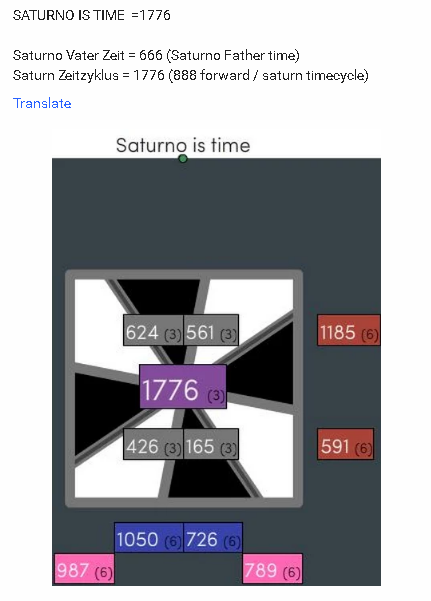 I realize that on this context it’s only natural to advertise for Saturn in Germany. After all, its also the base of the Brotherhood of Saturn. It’s these funny coincidences that always pop up in these inquiries! Gotta give props to Ready Set Go for making the RT cube / Saturn connection. I’ve always wondered why they seem to love spinning that green cube, since Russia does the red, white and blue, as does America, England, France, and many more. Well thanks, to RSG, now we know. 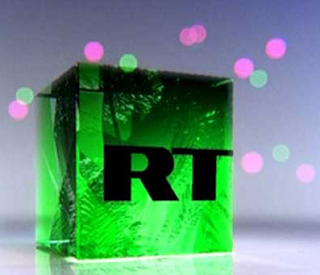 Ruptly is the company that is over the RT News operation, based out of Berlin. The acronym RT = 11 in English reduction. In mathematics, 31 is the 11th prime number. 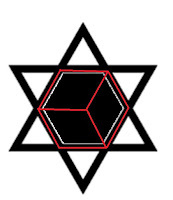 The hexagram or so-called Star of David is a six pointed star, which also has gematria that ties in directly to the symbolic structure of the cube. 41 is the 13th prime number. There’s another date numerology association occurs when 20 is left out for the commonly heard way of expressing years, such as ‘13. It’s just too easy to love the way the Russians do their propaganda. 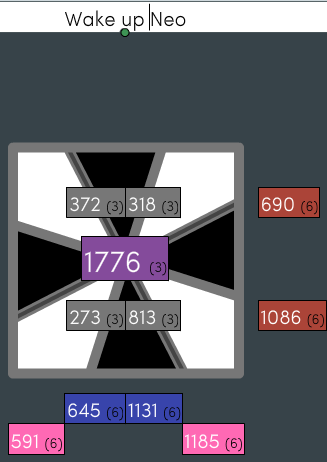 When I look at 14 in this context I think about these connections. The shootout with police happened three days later, 14 days from the launch date of Ruptly. 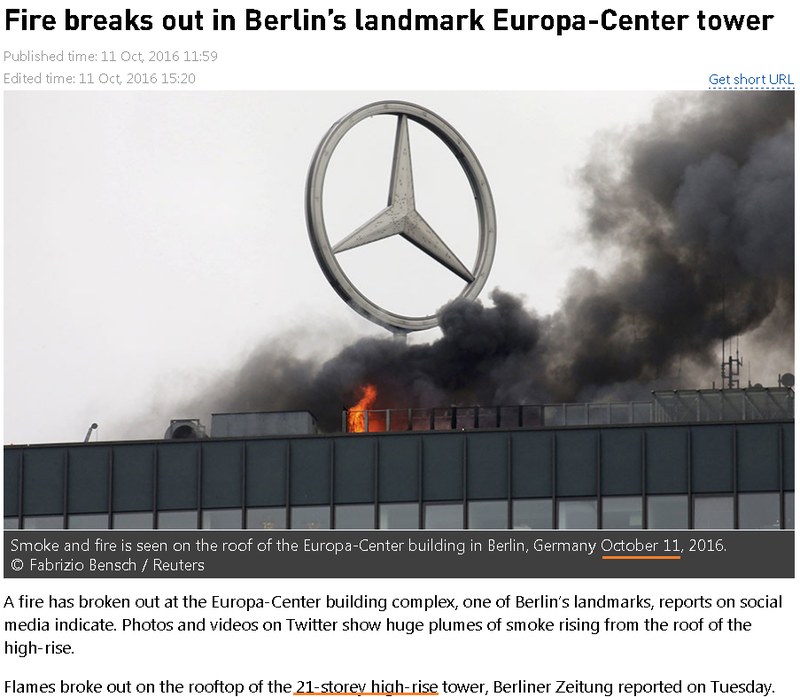 As TiWaZz pointed out to me the other day, on October 11, 2016 the Europa Center, Berlin was the scene of a very strange fire that “broke out” on the roof of the 21-storey high rise complex. Notice that October 11 or 10/11 reflects the building’s height and one of the most important numbers of Saturn. While almost anything is possible, there is one thing that is most probably not is that all of these connections are somehow coincidences. When you look at the scene from various perspectives, the fire with the trigram, three pointed star in its midst is the very likely a ritual tribute to Saturn. The date numerology, at least backs it up. 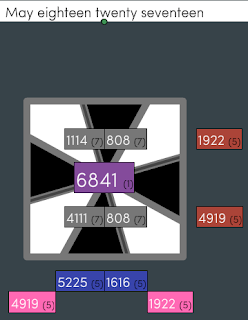 Gotta close for now with these syncs. You’ll need to download Adobe Air for it to work. It needs to be emphasized that the symbolism of the Demiurge as the Great Architect of the Universe is a symbol that’s revered in freemasonry and despised in most forms of gnosticism. 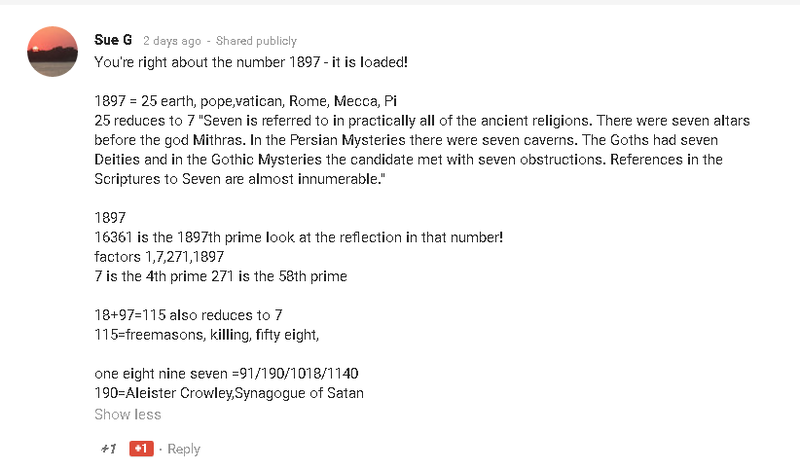 Just by looking at the gematria, the gnostics were trying to tell us something. His Greek name rendered in English as Demiurgos. In Hamlet’s Mill, de Santillana tells us that Frodhi’s mill is called ” the Crusher” or Grotte. 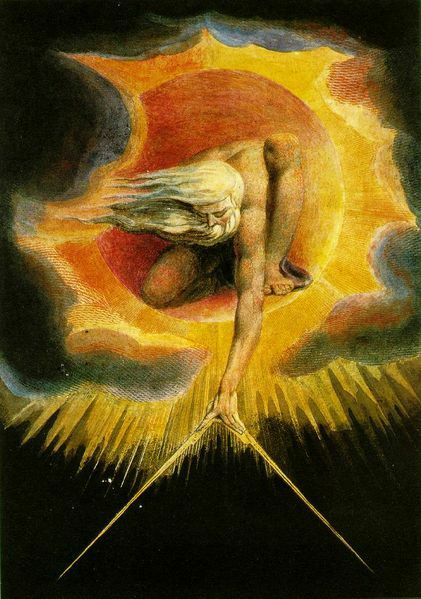 Williams Blake’s watercolor painting Ancient of Days is clearly a figure representing the Demiurge. See this article of more 1897 syncs. Sue G helped us out with these thoughts. There’s some really profound number work in her comment. Thanks, Sue! Here’s the link to the PDF of Hamlet’s Mill. 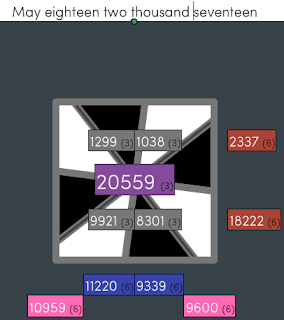 WE ARE IN A PANARCHY UNDER THE GOD PAN! DON’T PANIC! I just discovered Brother Sanchez, and his work on the “Panocracy” is well researched. His tone is confident and full of spirit. 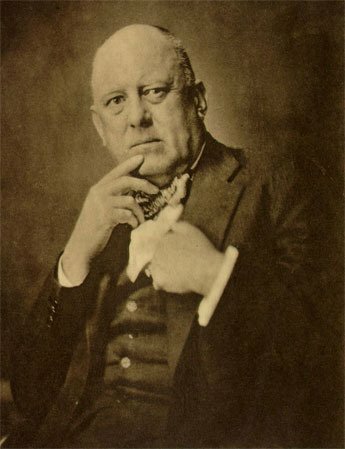 The most infamous quote of Aleister Crowley is his “commandment” for the what he foresaw as the coming “Age of Horus.” In this epoch man would achieve godhood. The center of Crowley’s world was his estate at Boleskine on the banks of Loch Ness in Scotland. 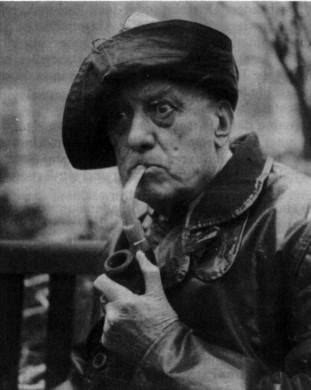 His followers in Thelema have designated Boleskine to be the hermetic Mecca. There’s even a prescription within occultism to face Boleskine when performing rituals and the like, in imitation of the Muslim practice of facing Mecca, Saudi Arabia during prayer. In this photo Crowley displays two masonic gestures that I believe can be interpreted as having a gematrical level of symbolism. For instance, Crowley’s rightt hand is close to his face where he’s pointing in a general direction toward his mouth with his index finger on his chin. Even his gaze has the “Listen to me,” look about it. The only thing is that his lips are sealed. His left hand is clutching his lapel in the “lion’s paw” salute with his hand close to his heart. The grip of the lion’s paw is how the master mason is raised up into the craft after his symbolic murder at the hands of the three ruffians. The caduceus is also known as the Staff of Hermes, a central rod entwined with two serpents, terminating in a sun-disk. The caduceus also represents the phallus of Baphomet, the goat-demon worshipped by satanists. Crowley prophesied a coming New Age, a return of the Golden Age of Kronos. The next article covers the mythology and background of that part of the story. He called it the New Aeon or the Aeon/Age of Horus. The number 1897 came up a lot today. Nor sure what it means, but it looks important. As stated before, many believers of Thelema pray toward Crowley’s estate of Boleskine, just as Muslims pray toward Mecca. The visions of Crowley’s Book of the Law center around the cryptic symbolism of the Stele of Revealing. Dezy of Nasa by the Numbers has found some powerful gematrical links which may point to the next “big event.” History and recent gematria research from the sites listed in this blog’s sidebar and many others have speculated on the distinct possibility of the fake assassination of Donald Trump throughout his campaign. One cannot ignore how this stunt could be used by those in power to further divide, confuse and manipulate the American people, and the people of the world. For the record, I don’t want to see any of this happen for the reason I just stated. Free To Find Truth showed that CNN ran old footage of the most-likely staged Reagan assassination attempt while discussing the “backlash” against Trump. That video is linked here. Once you watch the clips, you’ll see how the propaganda meter has gone from steady drip to fult tilt dookie storm. Here’s my transcript of the Lucifer TV show clip. Woman: So, global crisis averted? Lucifer: Yes, at least for now. 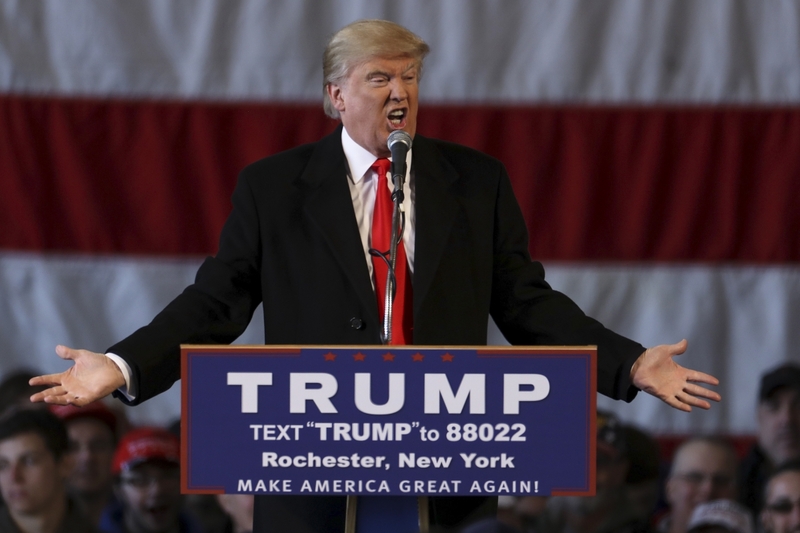 So… we can talk about…Caligula, Stalin, Trump…I mean… I know he’s not dead, but he’s definitely going. Caligula was, of course, one of the more psychopathic Roman emperors, as his name has become a byword for bloodlust, cruelty and vainglory. Stalin was the Soviet dictator that was responsible for the deaths of tens of millions of people throughout Europe and Asia.through war and state sponsored genocide. Trump would have to go a long way to come close to that kind of brutality, and it’s only a TV show, right? Anyway. check out Dezy’s finds, and the other great work he’s doing with uncovering the secrets of America’s space programs, at Nasa by the Numbers. After reading it, I wondered what would happen if I plugged his data into some other forms of gematria code. I discovered that it’s worth sharing. I’m including these screenshots of what is being called the “Roman Code” calculator. 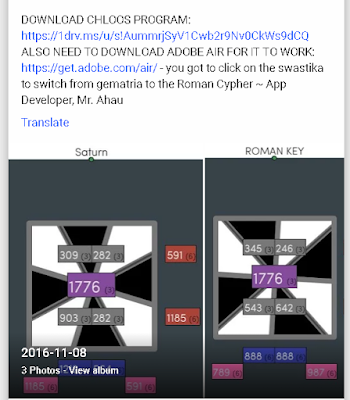 A contributor to DZ TiWaZz has a great post on Google + that explains how the cipher works. I’m planning on writing an article about this method as I learn more about it, but the results speak clearly. 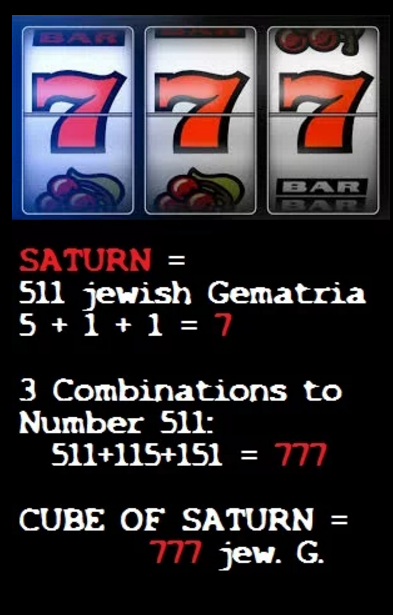 As we showed in Part I of The Code Saturn’s Cube, the number and sequence of 777 are very important to how the symbolism of Saturn has been used throughout time. On January 20, 2017, Inauguration Day, Trump will be 70 years, 7 months and 7 days old. That should help us to see something about how all of this works. Here’s another link between Trump and Saturn symbolism. January 21st will be Trump’s first day in office. 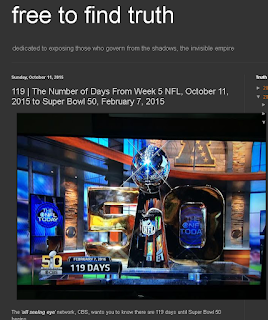 That’s the 21st day of the year and in English reduced gematria, Saturn = 21. 7 + 7 + 7 = 21. From his first full day in office until his birthday on June 14, there’s a span of 144 days. 144 is a number that is indelibly linked with the book of Revelation. 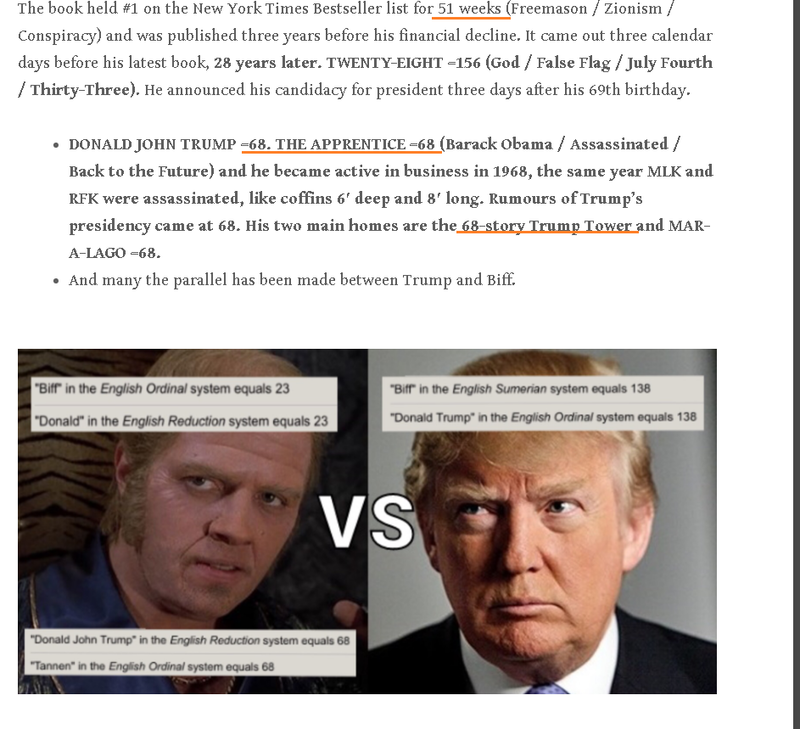 Zach Hubbard has shown good reason for the possibility of a May 18, 2017 day for the fake assassination of Trump in this article. Including the day of his inauguration, there is a span of 119 days to May 18th. 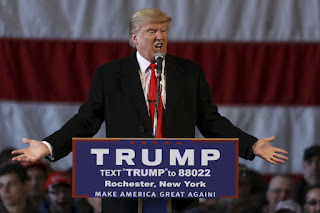 Zach points to a 2010 commercial in which the numbers 11 and 9 are stamped upon the sheep who are talking with the “Donald,” a name that has 119 gematria. I’m actually seeing another connection to these numbers, 51 or 5/1 for May 1st and the 119 connection.. For instance 51 + 68 = 119 As Zach often mentions, 1968 was the year the 911 national emergency dialing code was put into effect. It was the year that Donald Trump with 119 name gematria received his draft deferment at age 22. 1968 was the year that Martin Luther King , Jr was said to have been assassinated at age 39. As can be seen below, the numbers 22 and 39 also show up in the Perrin sequence. Bobby Kennedy is reported to have been shot and killed in 1968. If we keep the Perrin sequence in mind and go to 1951 some interesting connections come up. On October 17, 1951 CBS unveiled it All-See Eye logo, which is still in use today. 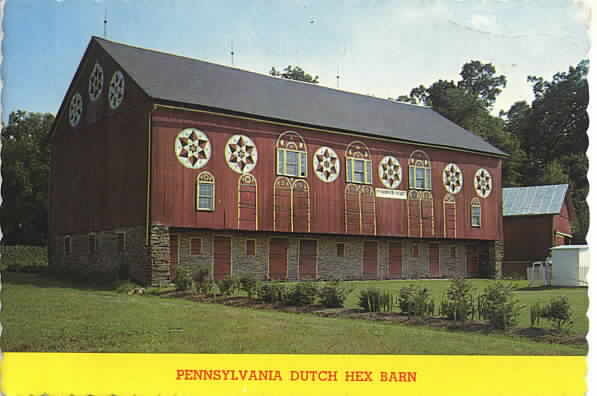 William Golden, the creator of the logo said that the inspiration for it came from the hex sign designs found on barns throughout Dutch Pennsylvania, like the one in the photo on the left. Both 17 the day of the month and the year ’51 are in the Perrin sequence. As many of us know, 119 comes up in the gematria of many key terms. It’s eyebrow-raising to see that William Golden claims the idea came from a hex design he saw on a drive through Pennsylvania when the gematria of All-Seeing Eye, and Star of David, which is a hexagram, all match up with 119. 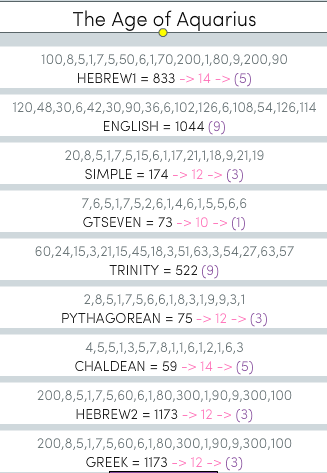 With 17, 51, 68, 119 found in the pattern of the Perrin sequence, there’s probably more waiting to be discovered. In the photo on the right, you’ll see a 119 tribute on CBS Sports in the form of an otherwise inexplicable 119 day countdown to Super Bowl 50 on February 7 or2/7, 2016. This occurred in Week 5 of the regular season. 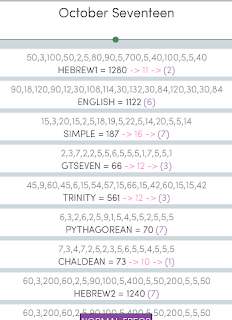 Th numbers 2, 5, 7, 119 are all part of the Perrin sequence. Super Bowl 51 will take place on February 5, 2017, which has a date numerology of 17. Both 17 and 51 are in the Perrin sequence. 2 + 5 + 2 + 0 + 1 + 7 = 17. Now here’s a kicker that’ll knock ya back to 1951! When you write out October Seventeen, remember that’s the day that the CBS logo was unveiled in 1951 you get the following numbers as shown with the Chloos app. 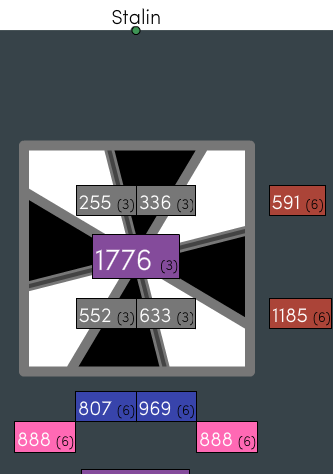 Let’s start with the simple English Ordinal gematria of 187. it happens to be the gematria for George Washington, the nation’s first president. 187 is also the often referenced “homicide code” for California and pop culture slang for murder. When you multiple 187 x 6, you get the sum 1122 for what’s variously called English or more distinctly English Sumerian gematria. If you divide 1122 like 11/22, that’s the date for John F Kennedy’s assassination. Most people’s image of the Kennedy assassination includes CBS anchorman Walter Cronkite, pulling off his glasses to tell us the news. The numbers just keep getting deeper, the GT-7 or Pi cipher yields the number 66. Bobby Kennedy was shot on June 6 or 6/6/1968. October Seventeen in Pythagorean gematria of what;s also known as English Reduction has the following numbers that match up with the word president. Once again, on January 20, 2017, Inauguration Day, Trump will be 70 years, 7 months and 7 days old. 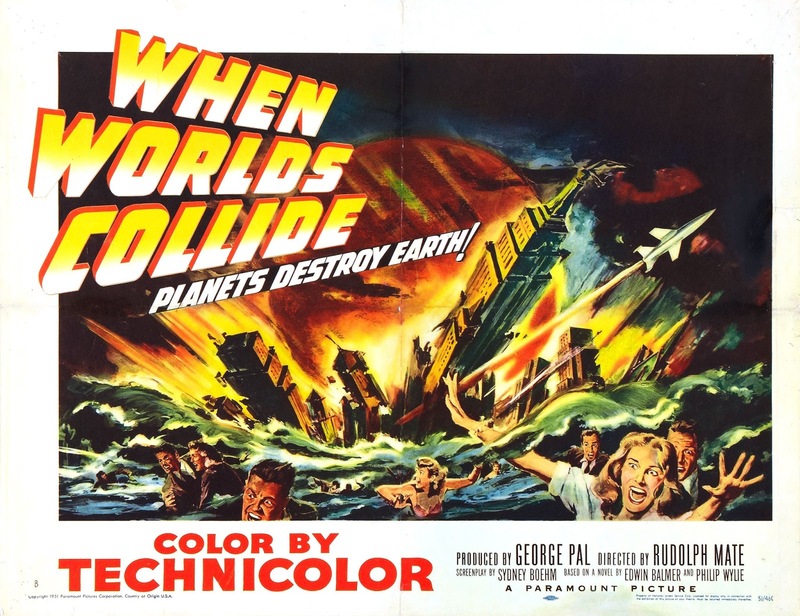 Tying back into the Perrin sequence symbolism on November 22, 1951, 11/22/1951, Paramount pictures released a science fiction thriller called When Worlds Collide. The YouTube video linked above shows how the movie When World’s Collide was used to encode the Mayan numerals for the 2012 end of the world scenario. In the movie, the main conflict involves the collision of Earth with the planet Bellus. A team of scientists plan and wealthy donors sponsor an escape for a chosen few to begin a new life on Bellus’ moon of Zyra. in the final scene, when the mission arrives on Zyra and Earth is no more, the final message, “The first day on the new world had begun.” I think there’s a lot more to be discovered in that film. Back to the Future character Biff Tannen and Donald Trump. Personally, I don’t make many predictions and I’m not making any now, but I thought I’d share these.great guesses. However, I agree that if one of these predictions turns out to be the day that Trump vanishes from the stage just as Brother Berg of Extra Capsca predicts from Biff’s disappearing act in the Back to the Future series, then those connections might help more to see how it all works. I’m also linking an article I wrote that covers some other interesting aspects of May 1st or 5/1, here. 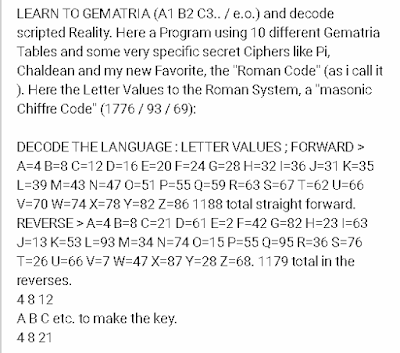 The Encyclopedia of Gematria has some interesting information on 51 as well. For your convenience, the navigation tabs are on the top of every page on this site. 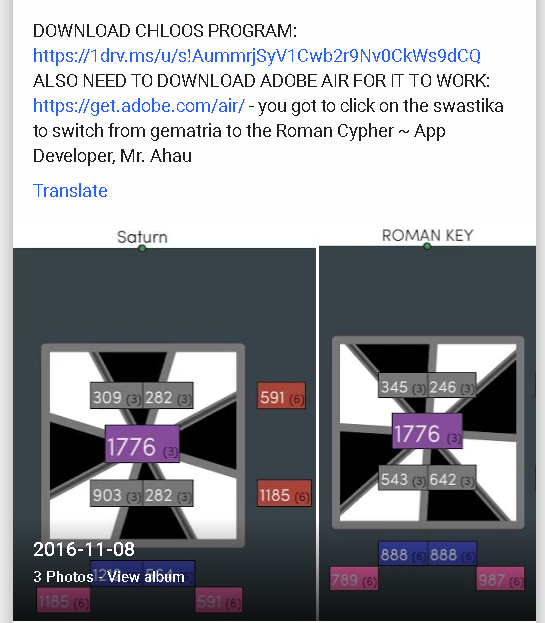 As can be seen in the Roman Code screenshots farther above, the Roman cipher the gematria for Saturn is 1776. The year 1776 is the founding year of the United States. On May 1st of that year, history tells us that the Bavarian Illuminati was formed. Labour Day is celebrated throughout the world on that day. In the old Soviet Union, the May Day parades were the biggest events of the year. The Nazis also loved strutting about that day. The fact that America celebrates Law Day on May 1st is something of a slap in the face. In the screenshot below, may 1st 2017 has some interesting numbers falling into place. When viewed through the Roman cipher, the patterns 114 and 411 jump out. Kennedy was shot from 411 Elm Street. 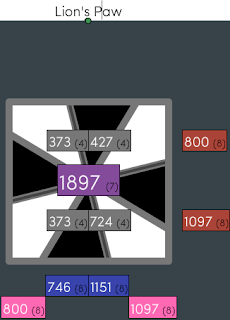 Both the backward sums of 808 reflects the gematria of Trump. When written out as shown below, the 11/22 pattern comes through. The one below is a connection TiWaZz uncovered. Donald got himself into the act with this one. The words Columbia, as in Columbia Broadcast System, Columbus and Columbian all derive from the Latin word for dove Columba. 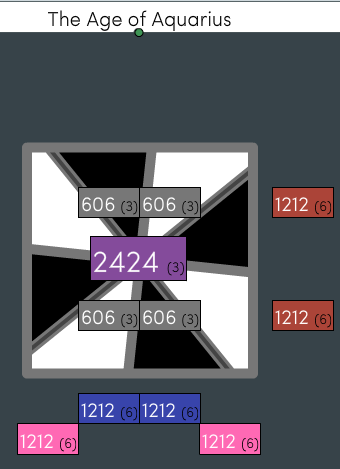 As you can see above, the numbers 223 and 322 come through the forward and reverse sums. 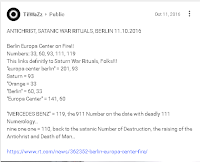 Those numbers are heavily linked in gematria and numerology. Remember how they said the CBS All-Seeing Eye is based on the Dutch Hex Signs? which yields a final sum of 2200. 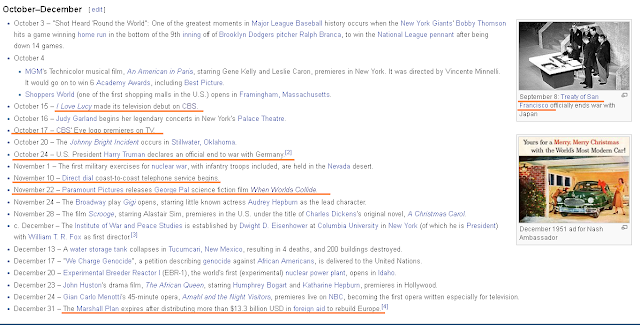 I Love Lucy might seem an odd connection, but look at when the first episode appeared on CBS, right about the same time these others events happened. 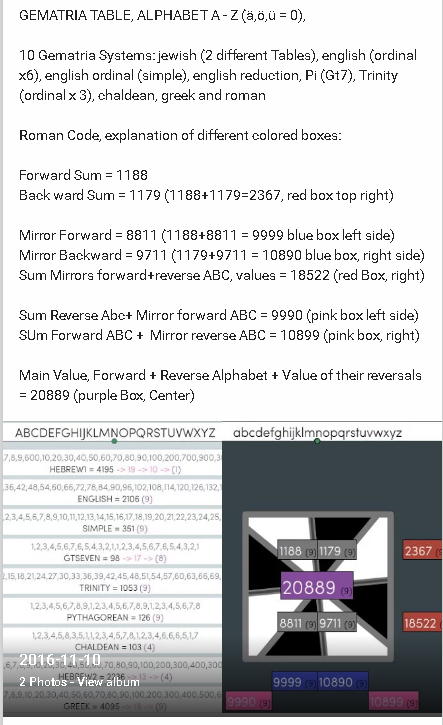 Because of the way the forwards and backwards summing takes place in this cipher it’s possible to have much smaller terms with large numbers. Strangely enough, both Lucy and I Love Lucy both add up to 2200, just like Trump. Speaking of the Perrin sequence, it also has a sum of 2200 in the Roman Code. 22 is a member of the Perrin sequence and it also happens to be one of the master numbers of numerology, since it’s a multiple of 11. The 119 sequence is also found in the 1190 forward-reverse sum. Here’s Donald Trump out selling his numbers 88 and 22. In the Roman Code, the forward sum is 130, when you reverse it, the zero is taken away and you have the number 31. 13/31 is a direct tie in back to Saturn’s Cube, as discussed in this article. The All Seeing Eye is often referred to as the Eye of Ra. Remember how Dezy pointed out that the Lucifer TV show compared Donald Trump to Stalin. That comparison holds up in gematria.